Dale Messick was born in 1906. She studied briefly at the Ray Commercial Art School in Chicago but left to begin a career as a professional artist. She began working for a Chicago greeting card company in the 1930s and was successful but quit when her boss lowered her pay. She moved to New York City and found work at another greeting card company at a higher salary, and began assembling a portfolio of comic strips. Messick created the character of Brenda Starr in 1940, naming it after a debutante from the 1930s and basing her appearance on Rita Hayworth. Messick wanted to produce a strip with a female protagonist; she decided a career as a reporter would allow her character to travel and have adventures, adventures more glamorous than those actually experienced by most reporters. 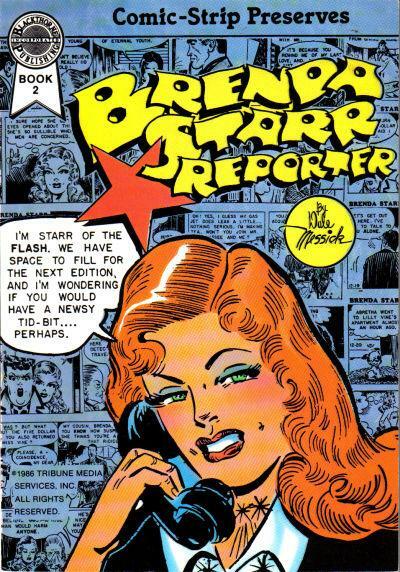 Brenda Starr was created by Dale Messick, one of the few female cartoonists of her time. Brenda Starr, Reporter debuted on June 30, 1940 in the Chicago Tribune. The strip became a daily feature in October 1945. Ms. Messick continued drawing Brenda Starr for over forty years, and died in Sonoma County in 2005. The original, hand drawn strips in the collection all date from 1947.